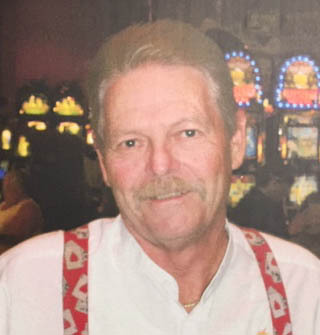 David Max Thorn, 72, passed away April 1, 2019, in St. George, Utah. He was born Jan. 27, 1947, in Spanish Fork, Utah, to Max and Ivy Thorn. He was the oldest of three children: sister Larcy and brother Tom. He was raised in Springville, Utah, and graduated from Springville High School in 1965. He then attended Weber State College, where he was drafted into the U.S. Army and then into the Vietnam War. He was part of the 101st Airborne Division and an Army Ranger. After his tour of duty, he served in the National Guard for many years. He was married to Laurie Bringhurst on Aug. 28, 1969. They were married for 40 years and later divorced, but still remained as close friends. They had three children and raised them in Mapleton and later in Ivins, Utah. He owned and operated Mr. T’s Gas and Goodies in Ivins, Utah, for many years. He then was the golf pro in Beaver Dam, Arizona. He later worked as a card dealer in Mesquite, Nevada. His favorite thing to do was golf and spend time with his friends on the course. His greatest love in life was his children and grandchildren. He will be greatly missed by his children Shannon (Paul) Hunt of McGill, Nevada, Troy (Marsha) Thorn of Mesa, Arizona, and Katie (Tyler) Kell of Washington, Utah; ex-wife Laurie Thorn of St. George, Utah; 10 grandchildren and one great-grandchild. He was preceded in death by his parents Max and Ivy Thorn. A memorial service will be held Saturday, April 6, at 1 p.m. at the Stonebridge Ward, 450 W. 3650 South, Washington, Utah. A visitation with the family will be held, prior to services, from 11 a.m. to 12:45 p.m. The family wishes to thank the doctors, nurses and staff at Dixie Regional Medical Center for the care and compassion that was shown to our father and family during this difficult time.